The Walking Dead ended season six on AMC with a huge cliffhanger that has been the subject of conversation all summer long. Will fans of the series see such a cliffhanger at the end of season seven? The Walking Dead will return to AMC on October 23. 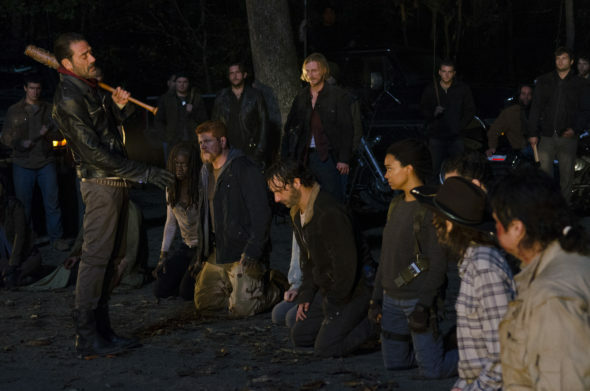 Were you a fan of the season six finale of The Walking Dead? Tell us what you think. I get real tired of the cliff hangers, so I guess I’m in the minority. I’m also not sure I’m as much of a fan. As one reviewer noted after 6’s cliff hanger, (paraphrasing, here), “Really, after six years of this and our intrepid group still isn’t smart enough to walk (drive) right into a trap? It’s not like they didn’t have lots of warning about this new guy, Negan.” That, true. You would think they would know better by now, especially after the Governor! I don’t mind cliffhangers, I think it keeps finales more interesting and exciting, but i certainly understand the frustration.